[134 Pages Report] Alpha Olefins Market size was USD 8.76 Billion in 2016 and is projected to reach USD 13.46 Billion by 2022, at a CAGR of 7.8% during the forecast period. In this report, 2016 is considered the base year and the forecast period is from 2017 to 2022. This research study involves the extensive use of secondary sources, directories, and databases (such as Hoovers, Bloomberg BusinessWeek, and Factiva) to identify and collect information useful for this technical, market-oriented, and commercial study of the alpha olefins market. The primary sources mainly include several industry experts from core and related industries and preferred suppliers, manufacturers, distributors, service providers, and organizations related to all segments of the industry’s supply chain. After arriving at the overall market size, the total market has been split into several segments and subsegments. The figure below illustrates the breakdown of the primary interviews based on company type, designation, and region conducted during the research study. 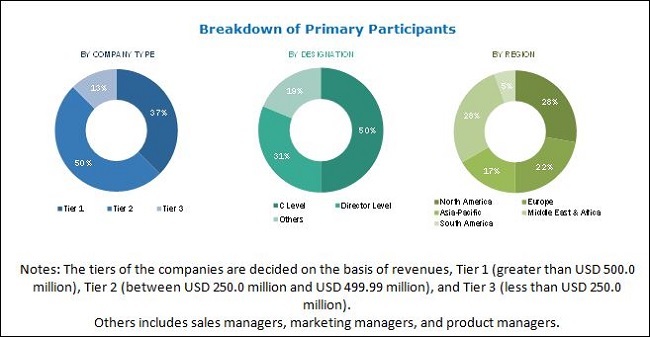 The global alpha olefins market is becoming increasingly competitive, there are many market participants, and some of these are market leaders. There are established players in the alpha olefins market such as Shell (The Netherlands), Chevron Phillips (US), and Dow Chemical (US), among others. These top players have significant control over the market and retain their respective positions by launching new products and are undertaking substantial investments to comply with regulations to produce energy efficient and environment friendly products. All these factors make the alpha olefins market highly competitive. This report categorizes the global alpha olefins market based on type, application, and region. The alpha olefins market is projected to reach USD 13.46 Billion by 2022, at a CAGR of 7.8% from 2017 to 2022. The market in several growing economies of the Asia-Pacific and the Middle East & Africa is expected to witness high growth owing to the increasing spending power, growth in the infrastructure industry, and growth in the manufacture of plastics and automotives. 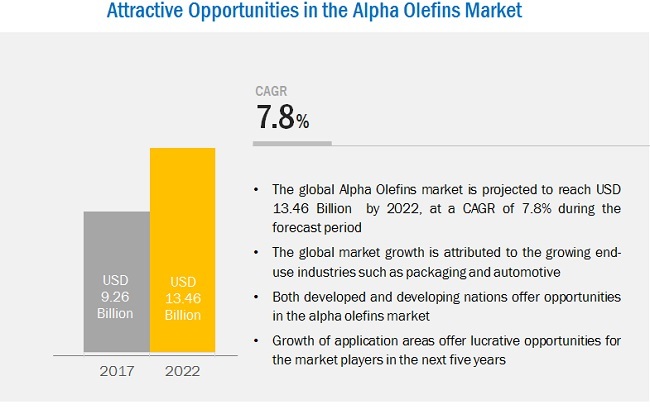 Moreover, increasing populations and rising consumption of packaged food are also contributing significantly to the growth of the alpha olefins market in the Asia-Pacific. The different types of alpha olefins are 1-Butene, 1-Hexene, 1-Octene, and others. Lighter olefins are primarily used in the production of polyethylene which is further used to manufacture LLDPE, HDPE, and others. 1-Octene is used to produce plasticizers and lubricants, among others. The increasing need for plastics such as HDPE, LLDPE, and LDPE across various end uses are also contributing the growth of the market for 1-Octene in the region. Additionally, alpha olefins provide a versatile range of polypropylene resins. All these factors are expected to lead to the increasing demand for alpha olefins during the forecast period. Based on applications the market is segmented into seven major types namely, polyolefin co-monomers, lubricants, surfactants and intermediates, fine chemicals, plasticizers, and oil field chemicals, among others. Polyolefin co-monomers occupy the largest market share in the alpha olefins market, as these are used to manufacture polymers such as LLDPE, HDPE, and LDPE which have various applications across several industries. North America was the largest market for alpha olefins in 2016, globally. High consumption potential, growing production capacities, competitive manufacturing costs, and high economic growth are the major driving forces for the market in the region. North America is characterized by technological innovations in various segments of the alpha olefins industry. It houses some of the top regional players such as Chevron Phillips (US) and ExxonMobil (US). High growth in the region is expected to be backed by increasing demand from the plastics industry coupled with rising awareness about environment friendly products. Whereas, the Asia-Pacific is projected to register the highest growth in the alpha olefins market. The increased demand from the plastics industry for the production of polyethylene is projected to drive the market for alpha olefins in the Asia-Pacific. Moreover, growth of the automobile industry is expected to lead to a surge in the demand for alpha olefins in the synthetic lubricants segment. In addition, major global players are establishing export oriented facilities in the Asia-Pacific region which is thus expected to further lead to an increasing demand for alpha olefins. The major drivers contributing to the growth of the alpha olefins market are growing end-use industries, discovery of shale gas, and increasing demand for polyalpha olefin based lubricants. Growing R&D investments for the development of alpha olefins are expected to act as an opportunity for stakeholders in the alpha olefins market. Developments in the market, including new product launches, expansions, and capital investments, are expected to the help the growth of the market. Leading alpha olefin manufacturers have opted for the new product launches and expansions strategies in order to sustain their market positions. Manufacturers are undertaking investments to increase their production capacities of alpha olefins to introduce new products. The companies profiled in this report are Shell (The Netherlands), Chevron Phillips (US), Ineos (Switzerland), SABIC (Saudi Arabia), Sasol (South Africa), Evonik (Germany), Dow Chemical (US), ExxonMobil (US), PJSC Nizhnekamskneftekhim (Russia), and Qatar Chemical Company Ltd. (Qatar), among others.